The Institute for Microbial Biotechnology and Metagenomics is a leading research unit based within the Department of Biotechnology at the University of the Western Cape. IMBM is committed to being a globally competitive institute through excellence in research and in the training of future research leaders, and hosts the DST/NRF SARChI research chair in Microbial Genomics. 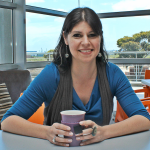 Professor Marla Trindade, as the research chair holder and Director, heads the Institute which comprises a team of over 45 researchers and staff.